Tungsten and and its alloy products are supplied by our facility located at the bulk of the world’s tungsten source. They are usually available in sheets, plates, rods, discs and bars. We also have the fabrication capacity to make precision machined tungsten parts and alloy parts according to your drawings. 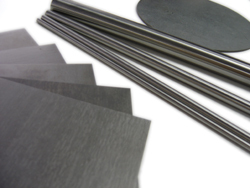 Tungsten is suitable for aerospace and high temperature uses which include electrical, heating, and welding applications. Hardness and density properties make this metal ideal for making heavy metal alloys such as copper tungsten that are used in armament, heat sinks, and high density applications. We are also a supplier of high-quality copper tungsten heat sinks. CuW heat sink is a composite of tungsten and copper. By controlling the content of tungsten, we can adjust its coefficient of thermal expansion (CTE) to match that of the other materials', such as ceramics (Al2O3, BeO), semiconductors (Si), and Kovar, etc. High Density Tungsten Alloys - The percentage of tungsten in high density tungsten based metals ranges from 90% to 97%. These machinable alloys have high density and high strength properties. Copper Tungsten Alloys - Tungsten content varies from 50% to 90%.